There are few better New Years Day morning hangover cures than a few rashers of bacon – crisped to perfection with your breakfast sauce of choice. Lets face it though, this isn’t the healthiest way to kick off 2018 and is probably not in keeping with your ‘new-year-new-me’ ambitions of a super clean and energetic lifestyle. Indeed, we should all be mindful of the serious toll such a diet can have on your body. According to disturbing 2015 findings from The World Health Organisation (WHO), processed meat – such as bacon – has carcinogenic qualities. Addressing this worrying issue, artisan food producer Finnebrogue have created a special new type of bacon said to be far less harmful. 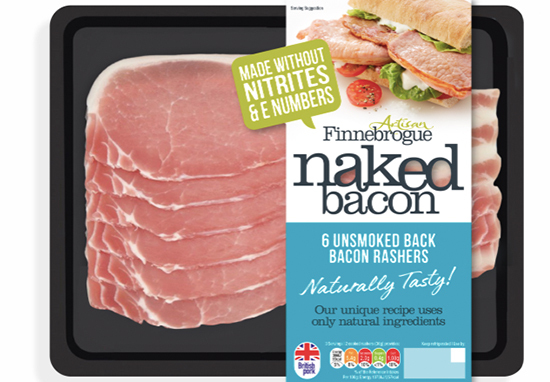 Northern Ireland based Finnebrogue’s ‘Naked Bacon’ apparently does not contain any nitrites, preservatives, E numbers or allergens – taking a much more natural approach to your traditional greasy fry up. Finnebrogue concocted the new au naturel flavouring in partnership with Spanish company Prosur – swapping nasty chemicals for Mediterranean fruit and spice extracts. The company has described the innovative product – which has taken a decade to research and develop – as being the ‘biggest revolution to the British breakfast for a generation’. And for those panicking about whether this means all that great bacony yumness will be lost – never fear. Naked Bacon has reportedly proved a favourite ahead of competitors during blind taste tests. The problem with bacon is dead simple. Bacon contains nitrites, nitrites produce nitrosamines in your gut and nitrosamines are carcinogenic. Nitrites should not be in food. I’ve been all over the world to figure out a way to make bacon without nitrites – and up to now we’d never made a single rasher of bacon because we couldn’t work out how to do it. For more than a decade I have insisted we not touch bacon until such time as we can make it better and safer – and now we have. Bacon is a staple of the Great British weekend – with Brits chomping through a colossal 159 million kg of bacon each year. However, all too often we forget what is actually in our favourite lazy-morning dish. WHO has compared the dangers of eating bacon filled with nitrites with asbestos or smoking. To have a bacon produced naturally, that doesn’t require such chemicals to be added or formed during processing, is a very welcome development. Making bacon without nitrites – and reducing the risk in the famous full English breakfast – is a remarkable feat of food technology and a brilliant British success story. Great news, I saw nitrate-free ham and bacon in French supermarkets in July so it’s good that the UK is finally catching up with alternative processes. You can expect Naked Bacon packets to hit supermarkets 10 January 2018, in stores including Waitrose, Sainsbury’s, Morrisons and Tesco. Perfect timing for your new year health kick, and an ideal pickup for those cold, gloomy January days.